I was asked the other day about my favourite side dishes and thought I would add a few of our staples to vgourmet.ca. I was asked by mostly parents on the run, trying to figure out how to put a healthy, fast, and tasty dinner on the table at the end of the day. One of our go-to meals is this tomato cumin rice – aromatic, delicate, and earthy – with sesame kale, and spicy marinated tofu. We throw in an extra veg if we’re up to it (steamed beans or sautéed carrots). And when the occasion calls for it we’ll add a bit of meat like asian chicken or garlic tamari marinated pork to the menu. It’s all good and everyone gets what they want, vegan or no. In a heavy-bottom pot or dutch oven, heat the olive oil. Add the onions and sauté until soft and translucent, about 4-5 minutes. Add the garlic and continue to sauté until the garlic is fragrant, another 2 minutes approximately. Meanwhile, roast the whole cumin seeds in a small skillet until they are browned slightly and aromatic but be sure not to burn them. Once done, crush them with a mortar and pestle if you have one, or if not, with a rolling pin. Add the cumin to the onions. Add the rice and mix thoroughly with the onion mixture. Let simmer for a minute or two. Add salt, stewed tomatoes, and water. Bring to a boil. 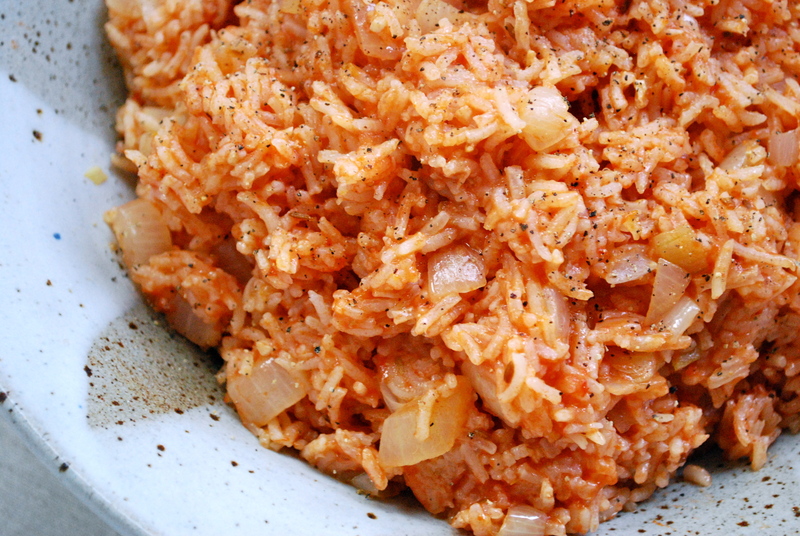 Turn down the heat immediately and then let simmer until the rice is done, about 20 – 25 minutes. Fluff with a fork and serve piping hot.